PhilaPlace - Brown St above 4th St.
Painting of African Zoar Methodist Episcopal Church. 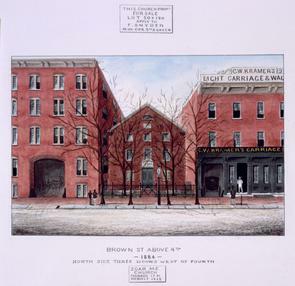 Captions in border (below): "Brown St Above 4th, 1884, North side three doors west of Fourth, Zoar M.E. Church, Founded 1781, Rebuilt 1838" (above): "This church propt. For sale, Lot 50 x 190, apply to F. Snyder, N.W. cor. 5th & Green."